Internationally recognized for his moving performances, innovative programming and extensive catalog of recordings, American conductor Gerard Schwarz serves as Music Director of The All-Star Orchestra an ensemble of top musicians from America’s leading orchestras featured in sixteen television programs that have aired throughout the United States on public television, worldwide by internet streaming and is the basis for their Khan Academy education platform that has already reached over 6 million students. All programs are released by Naxos on DVD and have been awarded six Emmy Awards and an ASCAP Award. 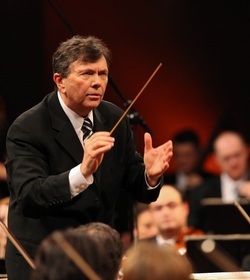 Schwarz also serves as Music Director of the Eastern Music Festival in North Carolina and Mozart Orchestra of New York, is Conductor Laureate of the Seattle Symphony and Conductor Emeritus of the Mostly Mozart Festival. From the fall of 2019 he will assume the position as Distinguished Professor of Music; Conducting and Orchestral Studies of the Frost School of Music at the University of Miami. His book “Behind the Baton” was released by Amadeus Press in March 2017. Schwarz is a renowned interpreter of 19th century German, Austrian and Russian repertoire in addition to his noted work with contemporary American composers. He completed his final season as music director of the Seattle Symphony in 2011 after an acclaimed 26 years - a period of dramatic artistic growth for the ensemble.